How did this family originate and what do we know about it? Answering this question is no easy feat. There are sources that possibly have something to do with with this origination, also with the origin of the Vreugdenhil-name. We’re following them here. A certain Willem Corsen van der Vliet, born roundabout 1505, of higher birth and nineman – meaning a member of the counsil of nine – of the village of Naaldwijk, which is made clear by a tax roll of the tithe of 1561, owns a private orchard on “Vreuchdenhil”. This piece of land supposedly was an area of about 5 acres. Sidenote: he and his wife, both 52 years old, alongside a deed of February 27th, 1557, bequeath an interest to the church and to the Holy Ghost Poor of Naaldwijk and a piece of land for the construction of the town hall. This old town hall still stands at the Wilhelminaplein in Naaldwijk. In the book of maps of Naaldwijk, second quarter (1620) (Streekmuseum in Naaldwijk) the before mentioned orchard (number 20) should be situated at the Vreuchdenhilsche Laentgen. More clearly it is mapped out on a drawing which has been come across in a transportdeed of April 22nd, 1634, (community archive in Naaldwijk). 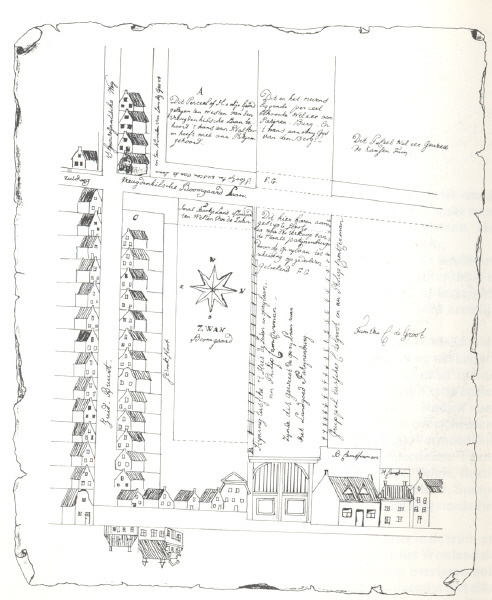 From this map was drawn that the Vreugdenhilsche Boomgaard Laan was situated where now the Willem van Hooffstraat can be found and especially the part between the Prins Hendrikstraat en de Willem de Sitterstraat. Moreover, it becomes apparent that on the north-western corner of the Vreugdenhilsche Boomgaard Laan and the ‘s-Gravesandtscheweg (nowadays Willem van Hooffstraat and Prins Hendrikstraat) one of the few small rental-homes was situated in this area. Perhaps this was the home where the ancestoral Vreugdenhil-family, which we nowadays know from the genealogy, has lived. However, at the moment it can’t be more than an assumption sadly enough. But, on the drawing the before mentioned orchard is pointed down as well and nowadays situated between the Willem van Hooffstraat and the backside of the buildings of the Wilhelminaplein. Also, the Vreugdenhilse Laentje appears on a map (also see the detailed map) of the Hoogheemraadschap Delfland (Delfland’s District water control board), measured by the surveyors Nicolaas and Jacobus Kruikius (1712). The Oude Spui (Spuisluis; Drain-sluice) where, successively Dirk Jochumszoon (C VI), Maarten (C VII f) and his son Dirk (C VII f.1) have been lockkeeper. This picture is from June, 1929. Nowadays it’s no longer there; it was around the Poortershaven between Maassluis and Hoek van Holland. Then there are also notes of Cornelis Goerdinck at the Cartelarium of the Begijnhof in ‘s-Gravenhage, written down between 1506 and 1513. Featuring in it is Jan Dirkszoon Vreugde, as payer of a certain interest on the land in the Nieuwland, living on the Hil. This Hil is still in existence and has down below a drainage sluice with a canal and a little further back a watermill. The original mill dates from 1575. At a later date it has been rebuild on the same place and also is still in existence there. Also, at the foot of the dike was another Hil-house, mentioned among others on the map of Balthasar Floris (1612). If this is the same house is not clear. Jan Janszoon Hondertpont, sworn messenger ‘of the Nyeuwelande ‘s-Gravesandt’ – meaning of the Nieuwland named ‘den Andel’ outside ‘s-Gravenzande – declares to have planted about 5 acres with marram grass, measured marram grass, planted in the chapter’s dune by Willem Janszoon Cuyper in 1557 (May 17th, 1558). Jan Janszoon, living at Vroechdenhil (x) in ‘s-Gravesandt, also gave a similar declaration concerning 7.5 acres, planted with marram grass in ‘s-Gravesandt in 1561 by the same Willem Janszoon Cuyper (December 13th, 1562). (*) ‘oe’ is the old spelling; later it is ‘eu’. Jan Janszoon himself couldn’t write, but all three of the deeds are signed with his mark. Based on that it’s clear that we deal the the same person in all three cases. The nickname Hondertpont, carried by Jan Janszoon n 1558, has been left out again in 1562. In a tithe roll of Zandambacht – a tax roll of 1562 – (archive of the Dutch Provincial Counsil of 1572, Royal Archive in ‘s-Gravenhage), Jan Janszoon can be found as Jan Jansen upten Hil, who outside the community of Nieuwland of ‘s-Gravenzande had a part of the dike in use of about 15 acres, booked at a rental of 15 pounds, therefore having to pay 1.5 pound as tithe. Moreover, there are bills of the Nieuwland outside ‘s-Gravenzande from the period from 1575 until 1600 in the city archive of Rotterdam. From these bills can be deducted that Jan Janszoon opten Hil died in 1586 and that Adriaen Joriszoon is called a descendant. How he was family-related couldn’t be pinned down. Until roundabout 1600 the name of Adriaen Joriszoon can be found in the bills, as well as the name of Jannitge Jorisdochter, as tenant of two pieces of land at the Maesdijk. Sadly enough there isn’t any more information known of this family. For how much all this has something to do with the Vreugdenhil-family we nowadays know from the genealogy, still is unclear. Concerning the Vreugdenhil-name we can assume that this is a so-called geographical name. Supposedly this is originated from the Vreuchdenhilsche Boomgaard Laentje, either from the ‘Vreochdenhil, within the area of ‘s-Gravesandt’. The Westlandic Vreugdenhil-family: almost four millennia of genealogy (1985).